Let's begin with a few important caveats: First, in the broad scheme of Robert Mueller's Russia probe, nobody beyond his tight-lipped team has a good sense of what evidence the special counsel does -- or does not -- have. That's why virtually all of the commentary about Mueller's work is conjecture, including some of what I'll offer below. It's also why any grand pronouncements of certitude about what the forthcoming Manafort verdicts may augur should be viewed skeptically. Second, this analysis is not meant to suggest that a blockbuster New York Times story published over the weekend is an unvarnished positive for President Trump. It's not. 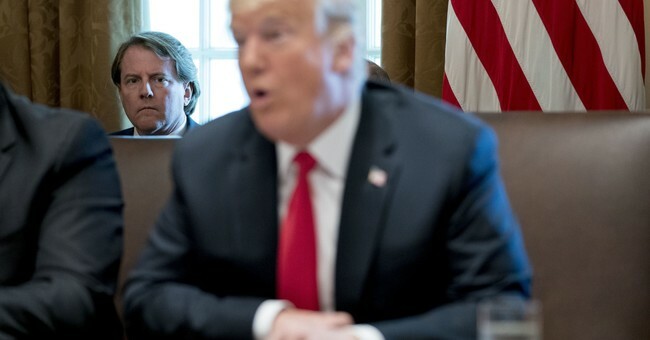 For instance, the very fact that White House Counsel Don McGahn was reportedly worried that Trump and his personal attorneys may have been setting him up to be a fall guy speaks to an atmosphere of paranoia, mistrust and dysfunction at the highest echelons of this administration. Between that revelation, the fear and loathing over perhaps hundreds of Omarosa's clandestine recordings, and a pattern of vengeful leaking, it's safe to say that this White House's culture is deeply unhealthy. With that context in place, somewhat lost in all the social media oohing and ahhing from journalists and politicos when the Times first published this article online Saturday afternoon were two crucial passages that appear to contain favorable news for the president and his defenders. Before we get to those, here are the first few sentences of the lengthy story, which is headlined, "White House Counsel, Don McGahn, Has Cooperated Extensively in Mueller Inquiry:"
The White House counsel, Donald F. McGahn II, has cooperated extensively in the special counsel investigation, sharing detailed accounts about the episodes at the heart of the inquiry into whether President Trump obstructed justice, including some that investigators would not have learned of otherwise, according to a dozen current and former White House officials and others briefed on the matter. In at least three voluntary interviews with investigators that totaled 30 hours over the past nine months, Mr. McGahn described the president’s fury toward the Russia investigation and the ways in which he urged Mr. McGahn to respond to it. He provided the investigators examining whether Mr. Trump obstructed justice a clear view of the president’s most intimate moments with his lawyer. Among them were Mr. Trump’s comments and actions during the firing of the F.B.I. director, James B. Comey, and Mr. Trump’s obsession with putting a loyalist in charge of the inquiry, including his repeated urging of Attorney General Jeff Sessions to claim oversight of it. Mr. McGahn was also centrally involved in Mr. Trump’s attempts to fire the special counsel, Robert S. Mueller III, which investigators might not have discovered without him. For a lawyer to share so much with investigators scrutinizing his client is unusual. In fact, Mr. McGahn laid out how Mr. Trump tried to ensure control of the investigation, giving investigators a mix of information both potentially damaging and favorable to the president. Mr. McGahn cautioned to investigators that he never saw Mr. Trump go beyond his legal authorities, though the limits of executive power are murky. Mr. McGahn’s role as a cooperating witness further strains his already complicated relationship with the president. Though Mr. Trump has fought with Mr. McGahn as much as with any of his top aides, White House advisers have said, both men have benefited significantly from their partnership. Last fall, Mr. Mueller’s office asked to interview Mr. McGahn. To the surprise of the White House Counsel’s Office, Mr. Trump and his lawyers signaled that they had no objection, without knowing the extent of what Mr. McGahn was going to tell investigators. Mr. McGahn was stunned, as was Mr. Burck, whom he had recently hired out of concern that he needed help to stay out of legal jeopardy, according to people close to Mr. McGahn. Mr. Burck has explained to others that he told White House advisers that they did not appreciate the president’s legal exposure and that it was “insane” that Mr. Trump did not fight a McGahn interview in court. Part of Trump’s optics problem re Russia matter (we don’t know what sort of legal peril he is/isn’t in) is that his volcanic tweet storms & fury at Mueller make him *look* guilty. Two key details in NYT story cut in opposite direction. Not necessarily exculpatory but interesting.